In a few short months the exorbitant redemption fees, deferred sales charges in our IG funds will taper off - once these "stealth wealth killers" expire we will be switching to some low cost ETFs. After all, the large Investors Group funds were basically market indices anyway. 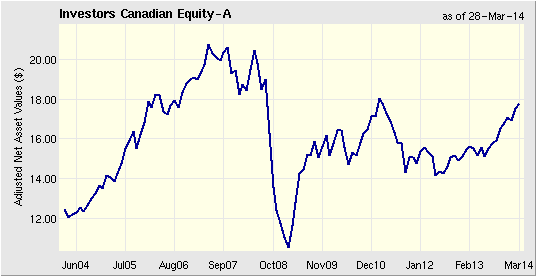 Here is Investors Canadian Equity and iShares XIU funds over the past 10 years. Same pattern except Investors never got as high as the index ETF, and has not recovered. Investors has a 2.26% MER compared to iShares S&P/TSX Capped Composite Index ETF 0.05% MER. Over 32 years, losing this 2.21% difference in fees will reduce your investment in half. That's just the power of compounding on seemingly small amounts. A comparison of other funds shows how the Investors Group management fees erode performance even more when the returns are lower. For example Investors Canadian Bond fund has a 1.81% MER - you can bet that does not leave much of the underlying returns back in your pocket.